If you think your pet has eaten something that is potentially poisonous, please call us immediately at 541-673-1345. If it is after our normal business hours, please us call to receive instructions to reach our answering service. With poisoning, time is essential: do not wait to see if things become worse! From the makers of FRONTLINE Plus, now comes the first flea and tick killer in a beef-flavored chew. Introducing Nexgard for dogs. It kills adult fleas before they lay eggs. Plus, it kills the American dog tick. Click here to learn more. Communicate with us online! 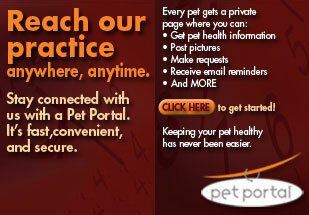 You can view your pet's information, schedule an appointment, refill a prescription and more when you sign up for your Pet Portal. Click here to get started. With many brands of flea and tick products available, it can be difficult to determine the best treatment for your furry friend. 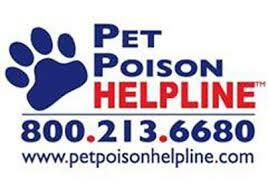 Be aware there are products on the market that can be harmful to you AND your pet. Pyrethroid spot-on flea treatments, which are approved for sale by the EPA, are linked to thousands of reported pet poisonings, involving serious medical reactions such as brain damage, heart attacks, violent seizures, and even death. Harmful ingredients to avoid include permethrin, tetrachlorvinphos, carbaryl, and propoxur. The EPA has classified each of these ingredients as either a "likely" or "probable human carcinogen". However, there are many safe flea and tick products available to treat and protect your pet. Be sure to read labels and consult with your veterinarian to determine the best product for your pet. To view safe, effective flea and tick products available at our clinic, please click here.